I think my wife was worried about me last night as I sat surrounded by four whisky nosing glasses (Port Askaig Cask Strength (57.1%), 17 year (45.8%), and 25 year (45.8%) expressions, as well as Signatory Caol Ila 14 year). I wanted to do a head-to-head and really get a feel for how these different Caol Ila expressions stack up based on my own preferences. If you’re unfamiliar with Port Askaig (and why I’m referring to them as Caol Ilas), check out my full PA 17 review and/or this introductory post on The Whisky Exchange Blog. In order to do the comparison, I ordered 30 ml samples of the whole Port Askaig range from whiskysamples.eu (my review of their service here). The Signatory was part of the mix just to provide a Caol Ila baseline for comparison. You can read my post on that one here. I’ll start with a recap of the tasting notes from my full Port Askaig 17 post, using that as a baseline for the two other Port Askaig expressions. I did a full comparison on one night, then tried the CS and 25 by themselves the next two nights. The first night, I nosed the full 30 ml samples, but then set 15 ml aside for the second tastings. I’ll describe the tastes, then editorialize more in the conclusion. On the nose, I get a strong citrus scent up front (lemon zest), followed by sweet peat and some smoke. Digging deeper, honey sweetness starts to turn a little richer, and there are possibly some apple notes in there. On the palate, some citrus remains with the sweet peat, and then a bit of a pepper kick comes in and then dies off. On the finish, as the pepper dies down, nice coal smoke builds up and joins the peat, coming up through the back of the nostrils. On the palate, it’s not really that hot considering the alcohol volume. It seems a bit one-dimensional, with sweet peat being the primary taste. No surprises here. On the finish, I’m getting that strong peat and coal smoke that I like with Caol Ila. Then it seems like a little of that dog food (or is it hay now?) comes back towards the end. On the nose, the citrus is toned way down from the 17, and what’s there is more of a candied orange than a zesty lemon. There’s a pretty strong caramelized sugar sweetness on this one, and the peat really takes a back seat to the other aromas. Overall, it’s quite mellow. On the palate, the sweet, mild peat is there, and a light pepper comes on. It remains pretty mellow, though. The finish is where I was most disappointed in this expression. The coal smoke that I like so much in Caol Ilas is all but gone. There’s an earthy peat and regular camp fire smoke that’s nice, but it’s not strong. Finally, I’m getting a tea flavor that reminds me of Bowmore 12. I don’t want tea on the finish. I want a solid peat/smoke combination. I’m really glad I purchased the Port Askaig 17 full size bottle over the other two expressions. It’s definitely my favorite. I wanted to be wowed by the 25 year. It did have an enjoyable nose, but it was also quite tame. If it had come on strong on the finish with coal smoke, strong peat, and maybe a pepper kick, I probably would have been more than happy with it. However, with it staying mellow throughout, and adding that tea flavor on the finish, the 25 just didn’t quite do it for me. It’s nice, but not £75 nice. Finally, the CS was more of a pure peat play. I could drink this on a fairly regular basis when I need a peat fix, but it didn’t offer me much more than that. The 17 year takes me back to the first time I tried Caol Ila 12 year. I took in that strong citrus scent that mixed in with the peat and sweetness, and proceeded to expect a relatively calm finish with muted peat and smoke. Then bang! That build up of peat and coal smoke came on, along with some pepper, and it made for a great experience from start to finish. The PA 17 gives me that experience, but with a little more class. Ok…I’ve been avoiding providing ratings, as I’m still working my way through a lot of distilleries for the first time, and continuing to discover my own preferences. I’m also only picking up a few scents and flavors, where more experienced whisky aficionados can coax out much more. However, I’ll try to convey my feeling on these Port Askaigs by assigning ratings to a couple of other scotches that I’ve written about and feel comfortable with, and then providing relative scores for these three expressions. Let’s say, just to provide context, that I were to assign the following ratings to other expressions: Laphroaig 30 (93 pts), Lagavulin 16 (91 pts), Laphroaig 15 (90 pts), and Caol Ila 12 (87 pts). Based on this, I would slot the PA 17 in at 89 pts, right up with my favorites. The PA CS and PA 25 would drop down to around 81/83 respectively; still very enjoyable drinks depending on my mood, but neither offering anything outstanding, and both having one thing that detracts from the experience (for my tastes). The Whisky Exchange Blog – Tim F provides his notes on the 17, and also states that this is his favorite of the three. 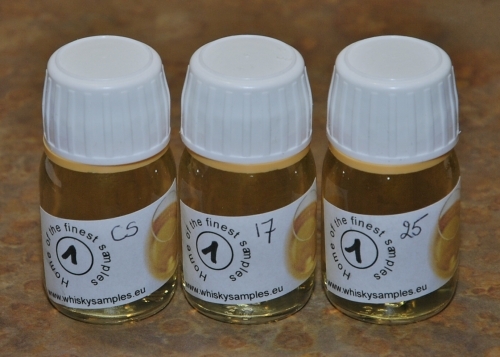 WhiskyNotes.be – Ruben provides great notes on the PA CS and the PA 25. He definitely likes the 25 more than I do, rating it at 88 pts vs. 82 for the CS. I’m looking forward to seeing what he thinks of the 17 year. Malt Advocate Blog – John Hansell also prefers the 17 year (91 pts) to the 25 (85 pts). His review is the one that compelled me to purchase my bottle of the 17 year. Edinburgh Whisky Blog – 17 and 25 year notes from Lucas. Caskstrength.net – Another comparison of the 17 and 25 year expressions, with both rated very close together. Spirit of Islay – Scroll down a bit for the 17/25 notes. He seems to really enjoy the 25 year. Dr. Whisky – [Aug 12, ’09 Update] The good doctor just did his own comparison of the 17 and 25 year. It doesn’t sound like he’s quite as crazy about the PA 17 as I am, but he does like both, and seems to also prefer the 17 to the 25. Here’s a link to the Festival Events page on the official Feis Ile site. You can see the main events taking place each day, giving you an idea of what people will be blogging/tweeting about and when. The Islay Blog is posting detailed festival events at the beginning of each day, as well as additional information and videos. Saturday event schedule, including a link to a PDF with an overview of the whole week. The gang at Caskstrength.net has teamed up with Tim Forbes from The Whisky Exchange Blog to attend Feis Ile and provide a single report daily, posted on both sites. Day Two report – Check out their Lagavulin tasting notes, including the Feis Ile bottling! Day Three report – A bunch of Bruichladdich tasting notes in this one, including one bottled that day. The Whisky Fun crew is posting tasting notes and ratings by proxy from a Belgian team led by Luc Timmermans. Luc is the one responsible for the whiskysamples web site (see “A taste of Feis Ile” below). Tasting notes for the Lagavulin, Caol Ila and Bruichladdich special Feis Ile bottlings. These are available only from the distillery during the festival. Will somebody like The Whisky Exchange get their hands on some bottles and make them available at a reasonable price? I sure hope so. I’ll be keeping an eye out for that Caol Ila cask strength. Read more about the special Lagavulin and Caol Ila bottlings (and see pictures of the labels) on The Intoxicologist’s Blog. Tasting notes for Laphroaig Cairdeas 12 and 10 CS Batch 1. Chris and Lucas were unable to make it to Feis Ile, but they do have Paula Arthur, who did attend, providing guest blog posts. She kept a detailed travelogue of her adventure,including pictures and tasting notes. The Great Islay Adventure: Part One – Getting there, arrival and meet-ups. Plus some notes on a couple of Caol Ila bottlings. A great read! IslayBlog.com – Armin has some Feis Ile stuff in his Weekly Islay Blogging Roundup. Keep an eye out for his roundup next week, as it’s sure to have a lot more interesting Feis Ile updates. Follow Armin on Twitter for additional, real-time updates: @islayblog. John Campbell, distillery manager at Laphroaig, and Margy McCoy from Friends of Laphroaig, are now on Twitter and posting updates during festival week: @Laphroigwhisky and @MargyMcCoy. Jura Bonus – Ok, they’re not at Feis Ile, but check out the Dubber and Clutch blog as they take a special trip to Jura with their Flip video camera, sampling new Jura expressions, and taking video shots during their inside tour of the distillery. You can also follow along with them on Twitter: @twhisky. [Update] It looks like Dubber and Clutch did manage to sneak over to Feis Ile. Tonight, we have the Port Askaig Islay 17 year single malt scotch, bottled at 45.8% ABV, non-chill filtered, and no added coloring. Port Askaig is a new range of single malts from Specialty Drinks Ltd (SDL), a sister company of The Whisky Exchange (TWE). Along with the 17 year, they offer a No Age Statement (NAS) cask strength, and a 25 year. Apparently, they’re also going to introduce a limited release 30 year expression later this year. This range was just introduced in late April, 2009, but is already getting a lot of buzz around the online whisky community. I think I have more links in my “Other Opinions” section on this post than for any other scotch I’ve blogged about. One of the things that’s interesting about this range is that they haven’t disclosed which distillery the whisky actually comes from. Current consensus on the internet seems to be Caol Ila. More about this later in my post. Port Askaig 17 is available from TWE for 50 GBP (current equivalent: $75). I believe it’s also available through select importers in other European countries, but it’s not currently exported to the United States. 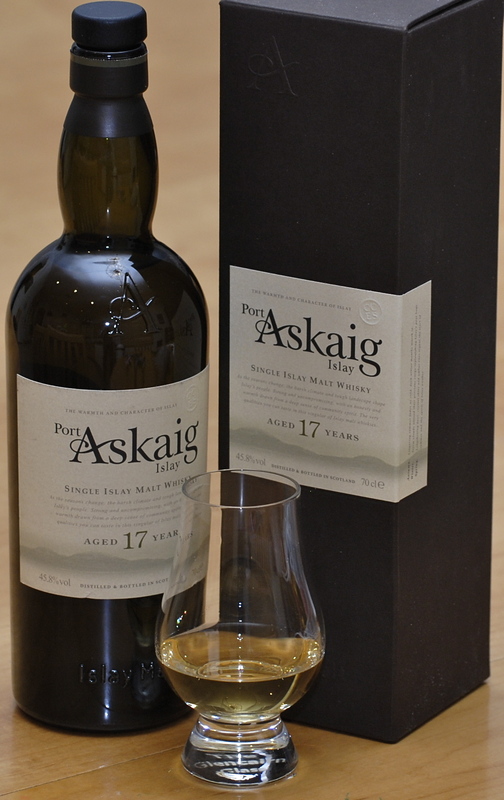 On the nose, the Port Askaig 17 immediately reminds of Caol Ila. That honey-sweet citrus right up front, with peat that isn’t quite as tarry as Ardbeg or Laphroaig, or as medicinal as Lagavulin. However, as I spent some more time taking in the aroma, I noticed that the citrus seemed different than the Caol Ila 12 or 18 original bottlings (OBs). With CI, I get a very strong citrus zest. The PA seems to take a little of that zesty edge off, like you’re just getting the inner fruit. With even a little more time and imagination, the citrus started to turn to apple, like I get with Ardbeg. Perhaps, also, that honey sweetness is a little deeper than CI, again more along the lines of Ardbeg. The last bit of “Ardbeg” that I’m picking up is a hint of “art store”…the aisle where they have the ink and pencils. Very interesting. I like this nose a little better than the CI 12 or 18. On the palate, I’m again immediately reminded of Caol Ila. The citrus and sweet peat are still there from the nose. It’s a tiny bit “hot” on the tongue, but in a good way, not a rough/cheap way. As it works its way towards the back of my tongue, some pepper starts to come on, building into the finish and slowly dying down. Also coming on with the finish is the Caol Ila coal smoke, and the earthy peat continues to linger. There are no bad after-tastes, and it goes down with a pleasant warming. My glass is emptying rather quickly. Conclusion: This is a very enjoyable dram. I think it’s a step up from the Caol Ila 12, Ardbeg 10 and Laphroaig 10 standard bottlings. Then again, so is the price. Port Askaig 17 strikes me very much as a bridge between Caol Ila and Ardbeg, which I think is a positive thing. It makes me want to try experimenting with my own vatting of CI 12 and Ardbeg 10. I’m going to put this close to (but after a head-to-head comparison, a little below) the Laphroaig 15 as one of my favorite whiskies so far, with Talisker 18 and Lagavulin 16/DE above that. If you’re an Islay scotch lover, you really should try to get your hands on this. If you’re a big Ardbeg fan, but Caol Ila not so much, I think you should still try this out. You might be surprised. If you’re in the U.S., the shipping cost makes it a little less cut-and-dry, as the Caol Ila 12 (Edit: or the Signatory 14 I’ve now tried) gets you pretty close to PA 17 for a lot less money. Update (head-to-head): The above notes were done without directly comparing the PA 17 with Caol Ila and Ardbeg. It’s a couple of nights later, and I decided to pour small drams of Caol Ila 12, Port Askaig 17, Ardbeg 10, and Ardbeg Uigeadail. So, any change of heart from what I stated above? A little bit. I said that I felt the citrus “zest” from Caol Ila was rounded off a little on the PA, but I’m not so sure about that. I’m getting that lemon zest this time. I also felt that the PA was much more clearly in the Caol Ila camp with this hands-on comparison. My bottom line here is that Port Askaig 17 is what I think Caol Ila 18 should be. I would gladly pay the additional $7.50 at TWE for this over the CI 18. Update 2 [6/4/09]: I’ve got samples of the PA 25 and Cask Strength on the way, so I’ll be able to compare the whole range. Woo hoo! The name: Port Askaig is located on the East side of Islay, a short ferry ride from Jura. If you look at a distillery map of Islay, you’ll see that Caol Ila is located right in Port Askaig, with Bunnahabhain just a little bit north of the Caol Ila location. The rest of the distilleries are much further to the South or West. The ages of the expressions: The NAS Cask Strength, 17 year, and 25 year expressions sure line up nicely against other common bottlings of Caol Ila, both by the original distiller (OB) and independent bottlers (IB). I mean really, how easy would it be for Specialty Drinks to come up with a bunch of 17 and 25 year (and don’t forget the 30 year later on) casks of Ardbeg? Ardbeg can’t even seem to get 17 and 25 year casks of Ardbeg. 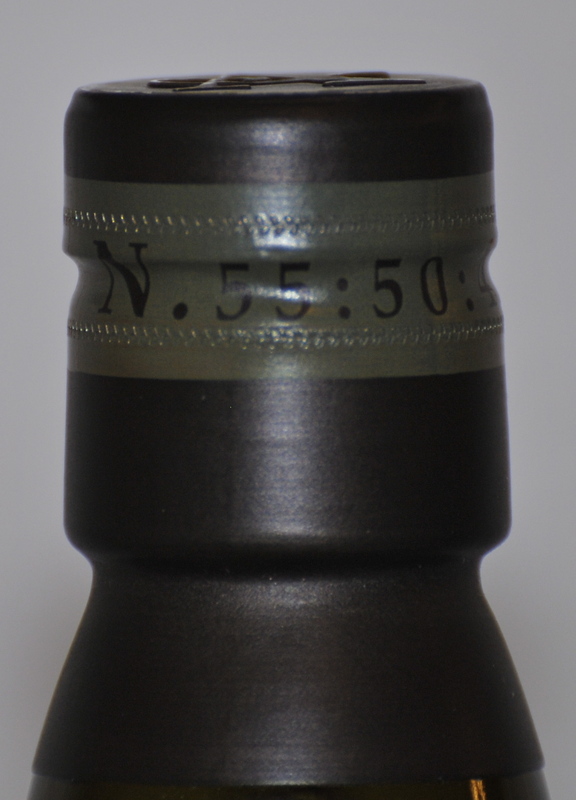 Geographic Coordinates on Bottle: Printed on the seal of the bottle is the following coordinates: N. 55:50:41 W. 06:06:10, which converts to Lat. 55.8447, Lon. -6.1028 in decimal. I saw this and thought perhaps this would be a clue. If it’s from another distillery, would they potentially provide a Latitude/Longitude that doesn’t match the actual Port Askaig location? However, punching in the numbers in Google Maps puts you right in Port Askaig, just a bit south of the Caol Ila distillery. Taste profile: While I could potentially be fooled in a blind test into believing PA 17 is an Ardbeg, the overall profile is certainly in line with the OB Caol Ilas I’ve tasted. Don’t take my word for it, though. The many tasting notes in the “Other Opinions” section below (by people with much more tasting experience than me) show a strong similarity to the Caol Ila profile. Clues from industry insiders: Check out the Malt Advocate blog post and comments, linked in the “Other Opinions…” section below. I know somebody who knows somebody…: I got a tweet (Twitter post) from @whiskyfan who says that “according to @hansemalt the German importer verified that Port Askaig is Caol Ila.” So there you go…I know somebody who knows somebody who knows somebody with inside information. The Whisky Exchange Blog – Tim F. writes about the new Port Askaig releases, and provides his own tasting notes for the 17 year. Malt Advocate Blog (What does John know?) – John Hansell provides notes and ratings for both the 17 and 25 year expressions. He really likes the 17 year. Edinburgh Whisky Blog – Notes and ratings personifications by Lucas of both the 17 and 25 year expressions. More extremely positive feedback. Caskstrength.net – More notes and discussion about the 17 and 25 year expressions, and more of a “statement” than a guess that this is from the Caol Ila distillery. Spirit of Islay (once it’s archived, this will be the link) – In the May “A Whiff of Peat Smoke…” newsletter, Gordon shares his notes on the 17 and 25 year expressions. There is also a discussion in Gordon’s Warehouse No. 4 forums. 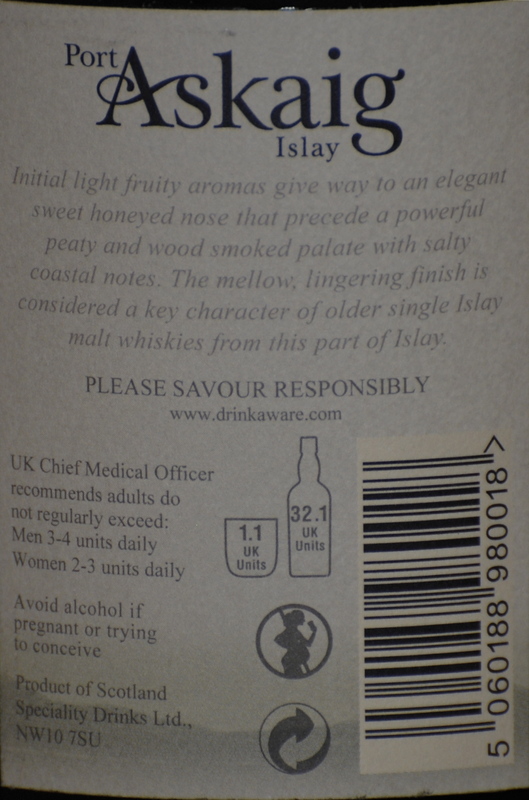 Whisky, Whisky, Whisky – Tasting notes on the Port Askaig 17 year. Making me feel much better about myself, Mark also noted a similarity to the Ardbeg profile. There’s also some additional discussion in the WhiskyWhiskyWhisky forums, kicked off by none other than Tim F. from TWE.